This is either an Anna's or Rufous hummingbird. She's a female (due to the green coloration) and is tiny, weighing less than 5 grams. 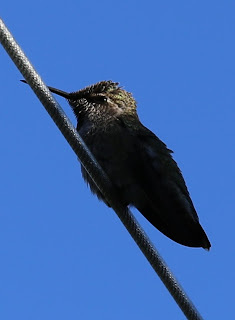 The song of hummingbirds like her is chattery and distinctive, and they're seen all over the Pacific Northwest.